Three nights, four days – how hard can that be? 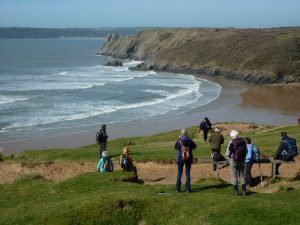 For a walking holiday newbie, RRC’s spring break in the Gower (not known for steep cliffs) ticked all the right boxes and I was in good, and friendly, company. 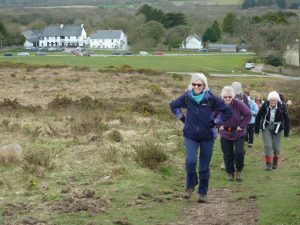 After an easy drive west, 22 of us arrived at the King Arthur Hotel in R eynoldston ready to stretch our legs on a seven mile walk along the spine of the Gower. The weather was fine and from Gower Way we were able to see both coasts of this lovely peninsula. All walks except the last were split into A and B groups though it was sometimes hard to tell the difference. So it proved on day 2, when we woke to a lashing gale which made the hotel bar’s log fire look especially tempting. However, that was not the plan so the A group set out at 9.30 on the first leg of their 13.5 mile hike to Rhosili and Llangenith. Half an hour later, the rest of us hopped into Mike’s taxis to start a ten mile walk from Rhosili along the coastal path. We had been looking forward to seeing the white sands of Rhosili Bay and the craggy Worms Head but it was not to be. Six hours later, having battled wind, rain and mud, we returned to the hotel to find a cheery A group who, after struggling through swamps for five miles, had found the prospect of a pub lunch and bus ride back irresistible. Respect for Colin, Mary and Lynn (over 80 and 4ft 10in) who completed a challenging 15 miles which included balancing on a rotten log to cross a stream. At supper that night there was a welcome glass of bubbly for us all, kindly provided by Vyv in honour of Buddig’s birthday, which she had spent getting soaked. As a friend pointed out, he must have been out of the room when the romance gene was handed out. Next day began and ended in glorious sunshine. We walked 10 miles along the coast from the beautiful Three Cliffs Bay with its spectacular ruined castle to the seaside resort of the Mumbles, where the two groups met for ice creams on the pier. Back at the hotel we were even able to have farewell drinks on the green, kindly provided by Hilary whose immaculate organisation made our stay such a success. Our final five mile walk along the beach from Llanmadoc started in a misty haze, which soon cleared to give a magnificent view over the estuary towards Carmarthenshire. Like all the walks, it was led and meticulously planned by RRC members. Many thanks to Vyv, Sally, Bob, Dave, Colin, Tom, Tim, Frank, Alison and of course Hilary for a very memorable holiday.